Want to know Who will win? In Today’s Dream11 Fantasy Cricket Prediction of CSK vs SRH 20th T20 Match IPL 2018 we will cover pitch report of Rajiv Gandhi International Stadium, Hyderabad, expected playing 11, dream11 best team, weather report of Hyderabad, what astrology has to say on the toss. We will also cover the playing condition, players recent and past performance, key players who are likely to perform, best choice for captain and vice-captain for fantasy leagues, dream11 guru prediction, all the latest news and updates of 20th match, where to watch the live match of SRH vs CSK and details of live streaming. But hold on, to gather these details it’s pain in the a**s but we are providing you all the details for FREE. So make sure to read the complete post to get 100% results. These data are absolutely free but you need to make your own team to get best results. Where Can You Watch the Live Streaming of SRH vs CSK or Channels to Watch? 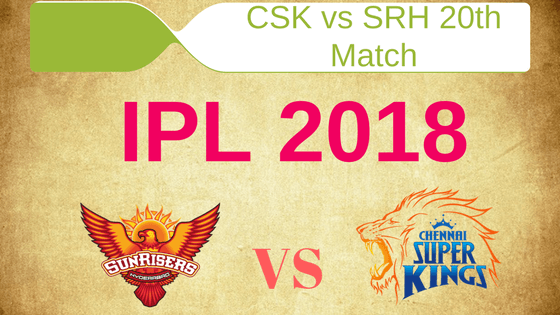 Who Will Win the 18th Match of IPL 2018 Between CSK vs SRH and Toss Prediction? What is the Best Combination of players for Dream11 in 20th Match, SRH vs CSK? Two matches were played here on this pitch in this season of IPL and both the games were a low scoring game. You can expect the same result in today’s match also. It will be a low scoring game. It will be a two-paced pitch which will help the seamers as well the spinners. The match will be played in afternoon so dew will not come into play. In the morning it is expected that it will be a sunny day. At the time of the play, it will be partly cloudy and it will remain the same throughout the match. The temperature is expected to be 38-Degree Celsius and the humidity to be 37% which may go up to 54%. No rain is predicted in today’s match. If we look at last five matches, CSK has a better record. Chennai Super Kings has won three games out of five games whereas Sunrisers Hyderabad has won 2 matches out of 5 matches. In overall encounters, CSK has won four matches and SRH has won 2 matches. In Hyderabad, they have won equal matches. Star Sports has paid a huge amount of INR 16,347.50 Crores to get exclusive rights of IPL 2018 for live coverage for five years starting from 2018 to 2022. Star Sports has all the media rights including TV and all Digital Rights. You can watch the full match of Sunrisers Hyderabad vs Chennai Super Kings on Star Sports. Shane Watson, Shardul Thakur, MS Dhoni (c & wk), Dwayne Bravo, Ambati Rayudu, KM Asif, Suresh Raina, Ravindra Jadeja, Karn Sharma, Sam Billings, Monu Kumar, David Willey, Deepak Chahar, Harbhajan Singh, Chaitanya Bishnoi, Imran Tahir, Dhruv Shorey, Faf du Plessis, Mark Wood, Kanishk Seth, N Jagadeesan, Murali Vijay, Lungi Ngidi, Kshitiz Sharma. Kane Williamson (c), Shakib Al Hasan, Wriddhiman Saha (wk), Alex Hales, Yusuf Pathan, Shikhar Dhawan, Manish Pandey, Ricky Bhui, Basil Thampi, Deepak Hooda, Rashid Khan, Bhuvneshwar Kumar, Mehdi Hasan, Siddarth Kaul, T Natarajan, Chris Jordan, K Khaleel Ahmed, Carlos Brathwaite, Sachin Baby, Mohammad Nabi, Tanmay Agarwal, Sandeep Sharma, Shreevats Goswami, Billy Stanlake, Bipul Sharma. Played 4 won three. This is the short story of both the teams. It was a big blow for SRH when Warner got banned and again their main batsman Dhawan got injured in the first ball of the previous match. On the other hand, Dhoni lead CSK side is performing at their best. CSK only lost their one game against KXIP. Their side is performing well. If they think of replacing any player they will replace Ravindra Jadeja and bring Harbhajan Singh in their playing 11 but this may not happen as Dhoni will definitely like to continue with winning team. So it is expected that CSK will play with the same playing 11. Ambati Rayudu, Sam Billings, Shane Watson, Shardul Thakur, Suresh Raina, Imran Tahir, MS Dhoni (capt & wk), Karn Sharma, Dwayne Bravo, Deepak Chahar, Ravindra Jadeja. If Dhawan is declared unfit before the match SRH may have to make some force changes Alex Hales will come in place of Chris Jordan and Sandeep Sharma will play in place of Shikhar Dhawan. SRH captain has confirmed that Dhawan’s injury is not a serious injury so it is most likely that they will only go with one change. Billy Stanlake will replace Jordan. Wriddhiman Saha (wk), Yusuf Pathan, Shikhar Dhawan, Shakib Al Hasan, Siddharth Kaul, Kane Williamson (c), Bhuvneshwar Kumar, Deepak Hooda, Manish Pandey, Billy Stanlake, Rashid Khan. MS Dhoni: Dhoni scored 114 runs in last 4 innings. He scored 5 runs in the last match and contributed 13 points. 66.52% of the users have selected him in their teams. Wriddhiman Saha: Saha scored 57 runs in the last four matches. He scored 6 runs in the last game and contributed 5.5 points. 32.11% of the users have selected him in their dream11 fantasy teams. Pro tips: Dhoni finds difficult to play leg spinners but still he is a better option. Make a combination of the above players for multiple teams. Shikhar Dhawan: He got injured in the first ball of the previous game and he may not play today’s match if he declared unfit. He has scored 129 runs in last 3 innings and contributed 96.5 points so far. 76.91% of the users have taken him in their dream teams. Suresh Raina: Raina scored 64 runs in last three innings. He scored 46 runs in the last match and contributed 29.5 points. 25 .7% of the users have chosen him in their teams. Kane Williamson: Most Consistent player of SRH. Williamson scored 146 runs in last 4 innings. He scored 54 runs in the previous game and contributed 36.5 points. 71.48% of the users have selected him in their teams. Ambati Rayudu: Rayudu scored 122 runs so far in this IPL. He scored 12 runs in the previous inning and contributed 9 fantasy points. 73.17% of the fantasy users have chosen him in their teams. Manish Pandey: Manish Pandey scored 72 runs in the last couple of innings. He scored 57 runs in the previous games. And contributed 37 points. 32.63% of the users have selected him in their dream11 teams. Sam Billings: Billings scored 68 runs in the last couple of games. He scored 3 runs in the previous match and contributed 11.5 points. 58.02% of the users have taken him in their teams. Pro tips: Make a combination of the above players. If Dhawan is declared unfit Alex Hales will play in place of him. Shane Watson: Shane Watson scored 175 runs and took 6 wickets in last 4 matches. He scored 106 runs, took 1 wicket and contributed 85.5 points. 74.48% of the users have selected him in their teams. Dwayne Bravo: This pitch is very much suitable for Bravo and he is most likely to perform today. He scored 104 runs and took three wickets in last 4 innings. He scored 24 runs and took 2 wickets and contributed 36 fantasy points. 75.77% of the users have selected him in their dream 11 teams. Shakib-Al-Hasan: Shakib scored 65 runs and took 5 wickets in last 4 matches. He scored 24 runs and contributed 13.5 points. 66.84% of the users have taken him in their teams. Pro tips: Try to keep all the players on your team, if you are playing small leagues. Make a combination of the above players for multiple teams. Bhuvneshwar Kumar: Bhuvneshwar Kumar took 5 wickets so far in this tournament. He took 1 wicket in the last match and contributed 12 points. 62.07% of the users have taken him in their teams. Rashid Khan: Rashid took 3 wickets so far in this IPL. He took 1 wicket in the previous inning and contributed 9 fantasy points. 55.74% of the user has taken him in their dream teams. Siddharth Kaul: Siddharth took 6 wickets in this season so far. He took 1 wicket in the last inning and contributed 12 points. 55.27% of the users have selected him in their teams. Imran Tahir: Imran Tahir took 4 wickets in last 4 matches. He took 1 wicket in the last inning and contributed 14 points. 40.84% of the users have taken him in their teams. Shardul Thakur: Shardul Thakur took 5 wickets in the last couple of games. He took 2 wickets in the last match and contributed 27 points. 17.28% of the users have taken him in their dream 11 teams. Pro tips: Try to make a combination of the above players. You can also take Karn Sharma in your grand league teams. Pro tips: You can select the above players as captain and vice-captain. Pro tips: You can keep the above players as captain and vice-captain in fantasy leagues. CSK has performed very well in this IPL and their top order batsmen are doing well, on the other hand, SRH Middle-order batsman failed to perform. Sunrisers Hyderabad has a very good bowling line. According to our prediction, CSK will win today’s match. The match is in afternoon so there will be no dew. This factor may lead both captains to win the toss and bat first and put pressure on the other side. According to our astrology team, CSK will win the toss and they will bat first. Taking players from all the three departments that is all-rounders, Seamers, batsmen and bowlers. Make a balanced team taking players from each department. Try to keep all the all-rounders. Conclusion: This is it for Today’s Dream11 Fantasy Cricket Match Prediction of CSK vs SRH, 20th T20 Match, IPL 2018 which will be played on Sunday 22nd April. You can give your valuable feedback in the comment section. Subscribe to our notification of latest updates. GOODBYE!